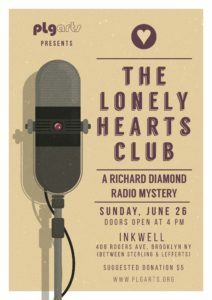 PLG Arts presents a live performance of an original radio drama, “The Lonely Hearts Case,” on Sunday, June 26, 2016, at 4:30 pm. This family-friendly staged reading will feature many artists local to Prospect-Lefferts Gardens and the surrounding neighborhoods. Admission: Suggested donation of $5.00.